Susan and Barry Schwartz invite you to join them for a relaxing stay in their newly redecorated turn of the century home. 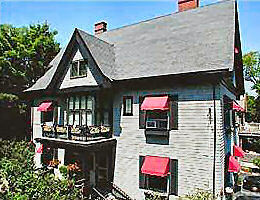 Built as a private residence in 1907, Hearthside is now a beautifully, appointed Bed and Breakfast. Our guest rooms, which feature a blend of traditional and Victorian furnishings, have private baths, queen sized beds and air conditioning. Some rooms have working fireplaces, private porches, whirlpool tubs or air conditioning. Our rates include our incredible full breakfast buffet, afternoon tea and lemonade with homemade cookies. Hearthside is conveniently located on a quiet side street in Bar Harbor; easy walking distance from shops, restaurants and picturesque Frenchmen's Bay, and a short drive to Acadia National Park. Rates: In season $100.00 to $150.00 per room. We cannot accommodate pets and no smoking is permitted in the house. We require a two night paid deposit, VISA/MC, DISCOVER and checks accepted.